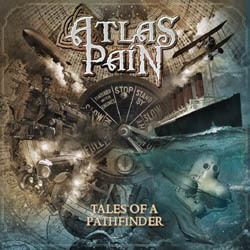 Epic folk pagan metallers Atlas Pain from Milan, Italy will release their second full-length album “Tales of a Pathfinder” on April 19th, 2019 via Scarlet Records. The stunning cover artwork has been handled once again by Jan “Örkki” Yrlund and the band photos proudly crafted by Ivano ‘Ozzo’ Tomba. “Tales of a Pathfinder” has been recorded, mixed and mastered by Fabrizio Romani (Media Factory Esine), with additional recordings by Davide Tavecchia (Twilight Studio). The band will premiere the whole album on a very special indoor show on April 20th, at Legend Club Milano, Italy in a completely free entry concert, with great support acts to be announced soon. As the result of efforts lasted two years, the concept around ”Tales of a Pathfinder” finds its foundation on an epic steampunk fairy tale, as the listener will be driven into a journey at the end of the world, making him discover unknown lands and hidden cultures. 1899, London. Laughs and noises from a freak show make space for the great announcement, aiming to start the most difficult expedition that the man have ever experienced. Each song, starting from “The Coldest Year”, the glorious announcement, is a specific stop that leads us to discover ancient tales and different cultures, making us appreciate all the different people around the planet. The journey finds its end with the disclosure of a brand new world, full of rising hopes, in a reality oppressed by machines and steam for a long time.